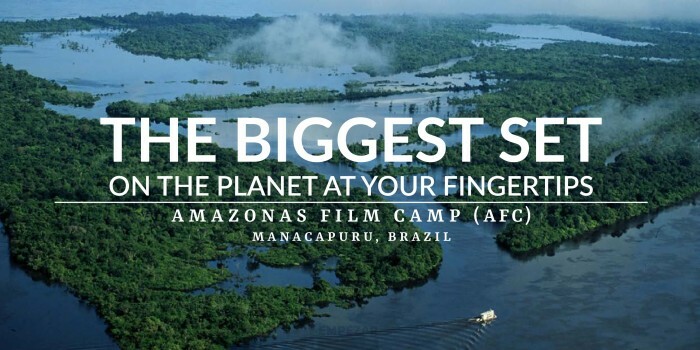 This is the first film set in central Amazonia to provide logistic cover and specialised field production for cinema and TV teams together with accommodation and access to the natural scenarios of the region. The AFC is located on a surface area of 1,500,000 m2 that is approximately 1 km wide and 2 kilometres deep. The versatility of the installations allows the accommodation of groups of 15 to 40 people. Situated on a high coast that visually dominates the Paroá Bay and its islands, this is a huge and varied scenario where it is possible to turn 360º without seeing anything out of place. Its privileged location allows easy access to wild places and to the productive rhythm of the local population with all the ingredients of both options. The two species of river dolphins appear regularly in the area, together with smooth and scaly fish, caimans, anacondas, and turtles; porcupines, sloths, chameleons and bats live on the many uninhabited islands that are scattered over the Paroá Bay. Fishing birds, raptors, macaws, toucans, orioles, vultures; the skies are always full of movement. In the nearby natural fish farms (of Arapaima, Colossoma, etc.) jaguars tend to prowl, stealing large scaly fish that they eat there and then to leave the remains of the feast. The jungle region on dry land is rich in felines, primates, rodents, snakes, ant-eaters, and tapirs. We can draw up an approximate estimate and show you that the biggest set on the planet is at your fingertips. The excellent value for money we offer will surprise you.